Dr. Konstantin Frank ignited the "Vinifera Revolution" a movement that forever changed the course of wine growing in the Finger Lakes and the United States. Dr. Frank's vision, knowledge and determination are credited with elevating the New York wine industry from a state of happy mediocrity to a level that today commands world attention. A European immigrant, Dr. Frank and his family arrived in the United States in 1951. After a brief stay in New York City, Dr. Frank, a professor of plant sciences who held a Ph.D. in viticulture, moved upstate to take a position at Cornell University's Geneva Experiment Station. In 1962, merely a decade after arriving in America, Dr. Frank founded Vinifera Wine Cellars. The winery quickly earned a reputation for spectacular Rieslings and its original planting of vines formed the backbone of New York's world-class wines and champagnes. "Expressive style with dominant characters of grapefruit, lime and star fruit notes. 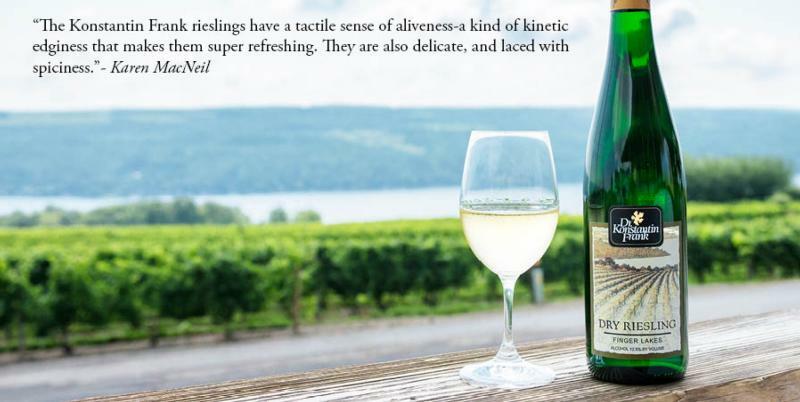 The crisp acidity enhances the distinct Keuka Lake minerality. All elements are perfectly balanced to make a wine that will last and continue improving for several years." "Medium intensity with dominant characters of spice, honey, rose with citrus undertones . The time on skins and the yeast used add palate weight and texture, while enhancing the mineral undertones. The light touch of sweetness is well balanced by a crisp acidity. ~Winery Notes"